As a community-owned and cooperatively operated business, co-op employees are some of Mississippi Market’s greatest assets. Our friendly, dedicated staff possess a wealth of knowledge. They work diligently to provide you with access to the freshest, healthiest foods and the safest, most effective personal health and beauty care products available. 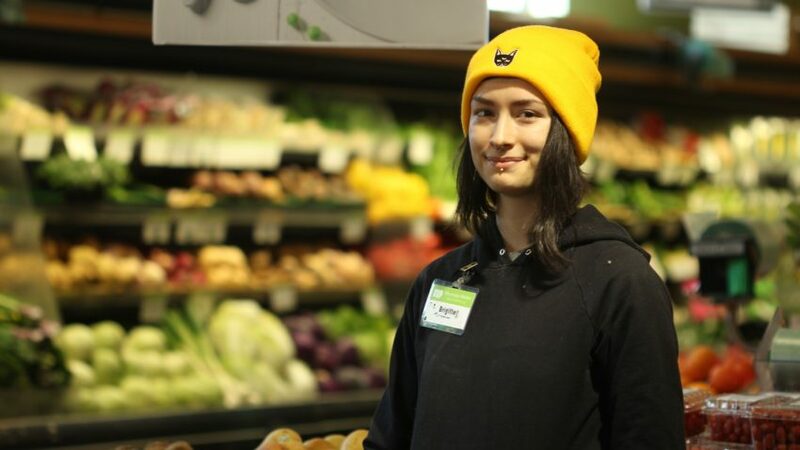 Our three stores employ over 200 people from our surrounding local communities who are passionate about sustainably grown and humanely raised foods; supporting local family farmers, vendors, and makers; and nurturing the health of people and the planet. We wouldn’t be here without them! I’ve been with the co-op for about three-and-a-half years now. I grew up in the Cathedral Hill neighborhood of Saint Paul near Mississippi Market’s Selby store. It’s produce selection and quality were like nothing I’d ever seen before in a grocery store. From then on, I knew I needed to get involved! The most rewarding part of my job is knowing that I’m selling something that is vital to the community, while providing education regarding the local food systems that allow our products to get from the fields into the homes of our members and shoppers. What differentiates your role at the co-op from other jobs you’ve had in the past? The connections I’ve made with the people in my community and my coworkers surpass what I’ve experienced anywhere else I’ve worked! The atmosphere can be relaxed and casual but challenging at the same time. All of this keeps me going throughout the week! What do you love most about working in produce? Creating attractive produce displays, sampling new products in-store for our shoppers and staff, and the winter citrus season! What are your favorite local produce items during the summer? Organic local salads and melons — the locally grown organic watermelon and cantaloupe we receive from Wheatfield Hill Organics, a fifth-generation family farm in Durand, Wisconsin, are amazing!